AT 76, William McIlvanney is enjoying a “genuine resurrection.” The author of Docherty and the Laidlaw triology has been discovered by a new generation of readers after publisher Canongate reissued his earlier books, and fans will be delighted to hear that he is now putting more of his unpublished work online. 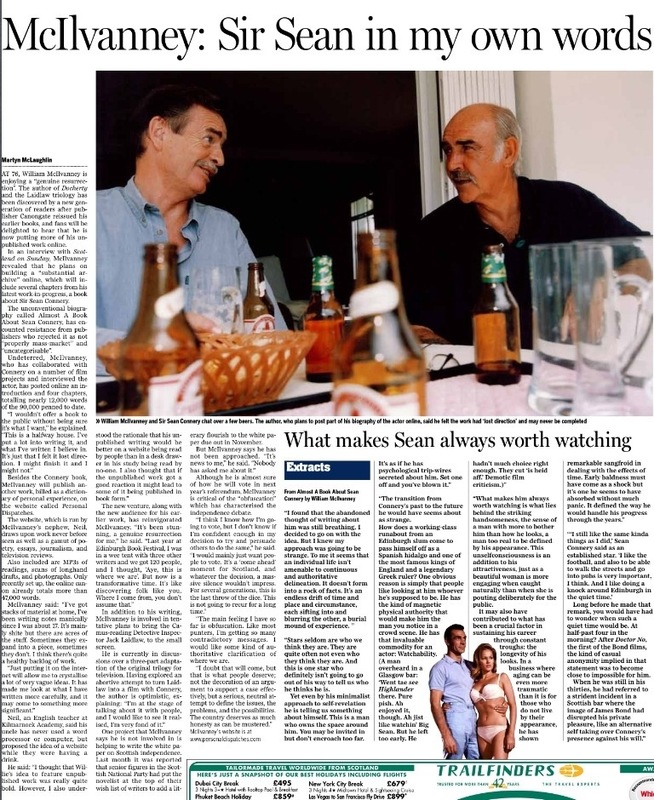 In an interview with Scotland on Sunday, McIlvanney revealed that he plans on building a “substantial archive” online, which will include several chapters from his latest work-in-progress, a book about Sir Sean Connery. Besides the Connery book, McIlvanney will publish another work, billed as a dictionary of personal experience, on the website called Personal Dispatches. The website, which is run by McIlvanney’s nephew, Neil, draws upon work never before seen as well as a gamut of poetry, essays, journalism, and television reviews.